Two Northrop Grumman-built instruments onboard a National Oceanic and Atmospheric Administration weather satellite have been activated to perform post-launch data collection. 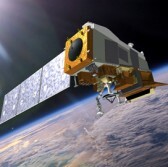 The initial set of data from Northrop’s Advanced Technology Microwave Sounder and Clouds and the Earth’s Radiant Energy System Flight Model 6 will aid startup and checkout tests before NOAA’s Joint Polar Satellite System 1 reaches full operational status, the company said Friday. JPSS-1 was launched into space in November aboard a United Launch Alliance‘s Delta II rocket from Vandenberg Air Force Base and officially designated as NOAA-20 once it reached final orbit. Northrop designed the ATMS to provide atmospheric temperature vertical profiles of the Earth’s surface to an altitude of nearly 28 miles and capture images of water vapor, precipitation and snow and ice cover. CERES FM-6 began to scan the Earth’s surface since its covers were opened Jan. 5 and ATMS achieved provisional maturity status Jan. 23. Other companies that developed NOAA-20 satellite instruments and features were Ball Aerospace, Harris and Raytheon. NOAA-20 is built to operate on the same polar orbit and 50 minutes ahead of the previous NASA/NOAA Suomi National Polar-orbiting Partnership satellite to monitor Earth’s atmosphere, weather, ocean and surface activities.